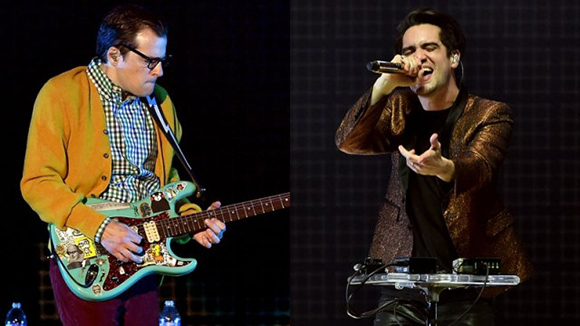 Two hot bands, one wild night, as Weezer & Panic! At The Disco team up for an epic 40 city trek across the US on a co-headlining tour this summer! The bands are coming to Farm Bureau Live on Wednesday 22nd June with Andrew McMahon in the Wilderness as support and it's gonna be a blast! Weezer are promoting the release of their fourth untitled album (known as The White Album) and Panic! At The Disco are promoting the release of their recent album Death of a Bachelor! Don't miss this show! Nerd-rock superstars Weezer, famed for their anthems "Buddy Holly", "Undone – The Sweater Song", “Hash Pipe”, Island In The Sun” and “Beverly Hills”, started their musical career in 1992 in Los Angeles. Since forming, the band has been through three changes of line-up and they have released nine studio albums, with their tenth (also self-titled, and known as The White Album) slated for release in 2016. Their eponymous debut album, commonly known as The Blue Album, was released in 1994, the year after they signed to Geffen Records, and is now triple-platinum certified. Weezer has sold 9.2 million albums in the US and over 17 million worldwide.